The Supply Grabber is a Law weapon designed to be used in the Supply Depot phase at the Gnawnian Express Station. A once simple, coal-powered industrial shipment crane that has been modified to be able to snag mice carrying Royal Supply Crates at high speeds. It fools mice with its slow and calculated movements until they come close, then it snaps into action and snatches them up! This trap is very effective while the Gnawnian Express is at the Supply Depot. 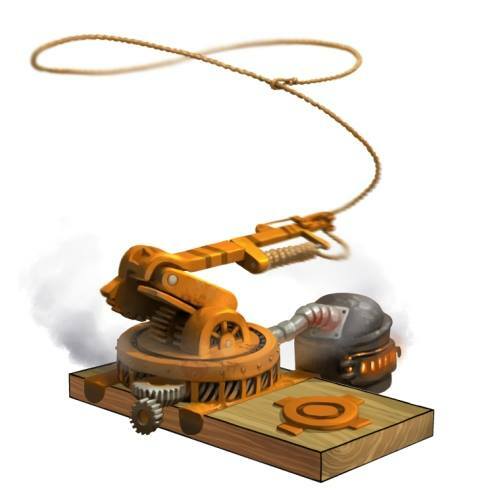 The Supply Grabber can be purchased in the Gnawnian Express Station Trapsmith for 150,000 gold, 300 Iron Pellets, 200 Copper Beads, and 100 Tin Scraps. It cannot be refunded. Provides an additional 1500 power in the Supply Depot phase at the Gnawnian Express Station. Engine Doubler - Provides an additional 1500 power in the Daredevil Canyon phase at the Gnawnian Express Station. 26 September 2013: The Supply Grabber was released with the introduction of the Gnawnian Express Station.